Along comes a brand new dub release from the Congos, not a reissue but a complete dub of their 2006 ‘Feast’ album, with one additional track for good measure. In between the guitar, bass, echo and reverb there remain traces of the original vocals from Cedric Myton, backed up by Brent Dowe. Original production is from Bunny Lee, with these new deep dub mixes courtesy of Dub King and Nuton Williams. Reggae has always renewed itself by continual reinvention, turning the old into the new, and this has never been more abundantly clear than on this album. The rhythms are those of some classic tracks from the peak of the vintage reggae era, given new vocals in the 2006 release, and now deprived of those vocals again in constructing a dub version of something that was already a re-creation, something simultaneously new and old. Bewildering. But good. The instrumental tracks are those of legendary musicians including Aston Barrett, Tommy McCook, Augustus Pablo, Sly and Robbie and Vin Gordon. The album opens with A Fat Dub (version of the Congos’ vocal track Fat Cook) which in turn draws its rhythm from Cornell Campbell’s Bandulu, the distinctive bass line instantly recognisable. A Party (version of Going to a Party) comes up next, using the familiar sound of the ‘real rock’ rhythm track, while God’s Kingdom Dub (version of God’s Kingdom) uses Johnny Clarke’s Prophesy a Fulfil as its source. These three opening tracks set the pattern for the rest of the album, comprising fifteen dubs in all. Amongst these, it’s sweet to hear Rasta Congo Dub (version of Rasta Congo Man), based on the joyful strains of Lee Perry’s Curly Locks rhythm. Heaven Dub (version of Heaven Rejoice) uses the great Satta rhythm, no less welcome for being so frequently deployed in reggae reconstructions over the years. 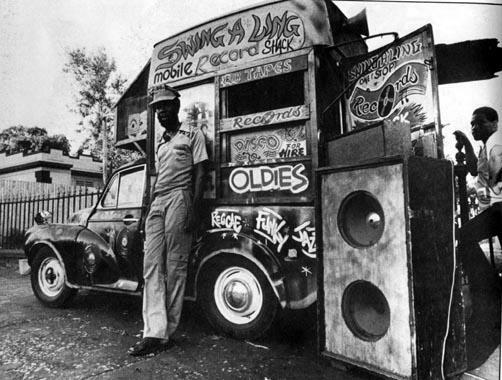 So we have an excellent collection of dubs, drawn from re-imagined vocal versions, over the top of original rhythms from the classic reggae era. Not sure in what sense this amounts to a Congos’ album, given that the sole Congos presence of Cedric Myton is, by definition, almost mixed out of the picture for a dub reworking. Not to worry, the end result is powerful bass-driven dub reminiscent of its golden age – and how nice of those persons at Jamaican Recordings to bother. At the end of the 1970s, Keith Hudson had managed to overcome the commercial failure of earlier releases such as Too Expensive (his only album for Virgin) by releasing the universally well-received Rasta Communication. Initially released on his Joint record label, and subsequently for wider distribution on Greensleeves, Rasta Communication looked set to propel Keith Hudson at last toward the reggae stardom of some of his contemporaries. But this was not to be. Subsequent releases did not always strike the mood of the moment as reggae evolved during the 80s, and Keith Hudson died in 1984 at a time when he was still actively recording with ex-Wailers Carlton and Aston ‘Family Man’ Barrett. Listened to afresh, Rasta Communication, recorded at Randy’s Studio and Channel One in Jamaica, at Chalk Farm studios in London, and mixed at King Tubby’s, still sets a musical benchmark. The musicians involved include Earl ‘Chinna’ Smith, Robbie Shakespeare and Sly Dunbar, with Prince Jammy and Clive Chin to be found amongst the engineering credits and not surprisingly the production values are high throughout. Overall the songs combine melodic reggae tracks such as I’m Not Satisfied with roots songs like Felt We Felt the Strain, while the two versions included of Jonah rock along in classic reggae style. For this brand new Greensleeves release, the ten tracks of the original vinyl album are supplemented by five further 12” mixes and versions, only one of which (the 12” version of Nah Skin Up) was included on the earlier Greensleeves CD release of the album. Still more, this ‘deluxe edition’ now includes a second disc consisting of dub versions of the entire album with some standout dubs – including My Eyes are Red Dub and I Broke the Comb Dub, plus another Jonah version – that stand alongside any of the dub classics of the time. This release finally does credit to the potential of this album. Listen to it if you can alongside his other great reggae release – 1974’s Pick a Dub – and you’ll know all you need to know about Keith Hudson. Recorded in 1977 at Lee Perry’s Black Ark studio, this album now appears in its entirety for the first time. Its recording appears to have been a trying experience for Kilburn’s Candy McKenzie who, despite earlier experience of reggae recording by providing backing vocals on Aswad’s first album, seems to have been ill at ease in Perry’s frenetic and unpredictable world. There are some mightily impressive musical names involved here, including Boris Gardiner and Ernest Ranglin, but the end product is mixed in both its quality and lasting power. Without doubt the strongest songs are those written by McKenzie herself – ‘Jah Knows’, ‘Sky at Night’, and ‘Keep Him Strong’ – which are characterised by a slow and slightly melancholy feel, consistent with some of the emergent lovers’ rock of the time. These are also the tracks on which Perry’s trademark production is most active and effective in the background, keeping the songs moving along in a fine late-70s reggae style, and worth hearing now. Elsewhere on this collection can be found a creditable take on the well-known ‘Breakfast in Bed’, although McKenzie sounds less than engaged in her vocal delivery. Perry’s own compositions are as idiosyncratic as might be expected. The opening ‘Disco Fits’, with its whimsical words and structure, could have been penned and produced by no one other than Perry. The rhythm of the closing track ‘When the Big Day’, jointly written with McKenzie, combines what are presumably her thoughtful words with Perry’s eccentric arrangement. It has to be added that if Perry’s nonsense track ‘Ice Cream’ had remained unreleased the reggae world would not have suffered greatly. But it is pleasing that this inconsistent and, in places, unrefined production has eventually seen the light of day, as there is enough evidence of what might have been as reggae started to evolve further at the end of the 70s. It seems that the only previous release from these sessions was a very limited release, of which McKenzie was unaware, of a 12” vinyl of ‘Breakfast in Bed’ and ‘Disco Fits’. After going on to enjoy success working with illustrious names like Leonard Cohen and Diana Ross, Candy McKenzie died in 2003. Well it’s only been half a century, but here comes the reinvention of the classic Duke Reid’s label, courtesy of Trojan Records. Significant indeed in the pre-reggae era of ska, and the big band Jamaican fusion of musical styles at the end of the 50s and start of the 60s, Arthur ‘Duke’ Reid was a key figure in several senses: founding the Treasure Isle label, and making the decisive move from the sound system to record production. That move gives the music a certain permanence and, as to demonstrate the point, Trojan now offer a new 7″ single with the Duke Reid imprint. On one side can be found Roland Alphonso’s rendition of the standard ‘Easter Bonnet’ (with ‘Duke Reid’s Band’), delivered in a fine brass-dominated lilting ska style. The musical support from the Duke Reid All Stars is in fact provided by those who would soon become the seminal outfit known as the Skatalites. The other side, from 1962, is ‘Feeling of Love’, from Wilburn ‘Stranger’ Cole and Ken Boothe, both still going strong. Easter Bonnet/Feeling of Love, release May 2012: issued in 500 numbered vinyl copies.